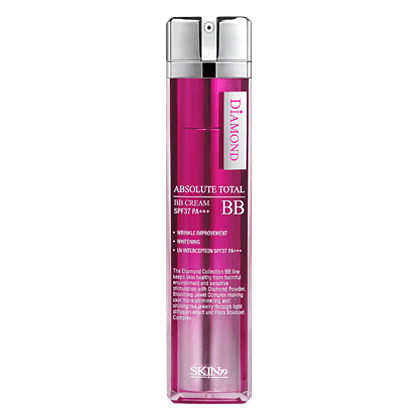 [Features] SKIN79 Absolute Total BB Cream SPF37 PA+++: HIGH CLASS BB CREAM FOR BRILLIANTLY SHINNING. 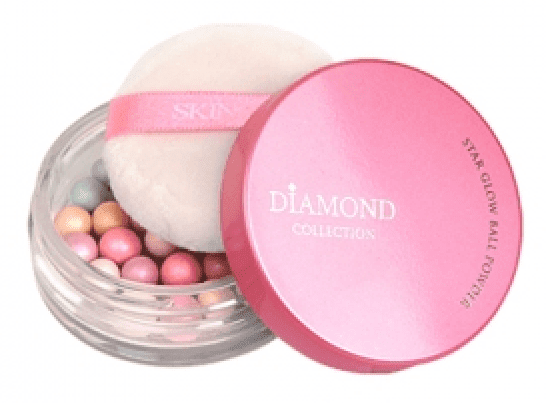 Diamond powder and jewel ingredients are included to maintain healthly and transparent skin while a special patented ingredient protects the skin from outside irritants to help keep skin moist. [How to use] After using basic products, grab the top of the pump and rotate it clockwise to unlock the pump. Gently push the middle of pump at top and put proper amount on the entire face. Then spread it evenly for absorption. 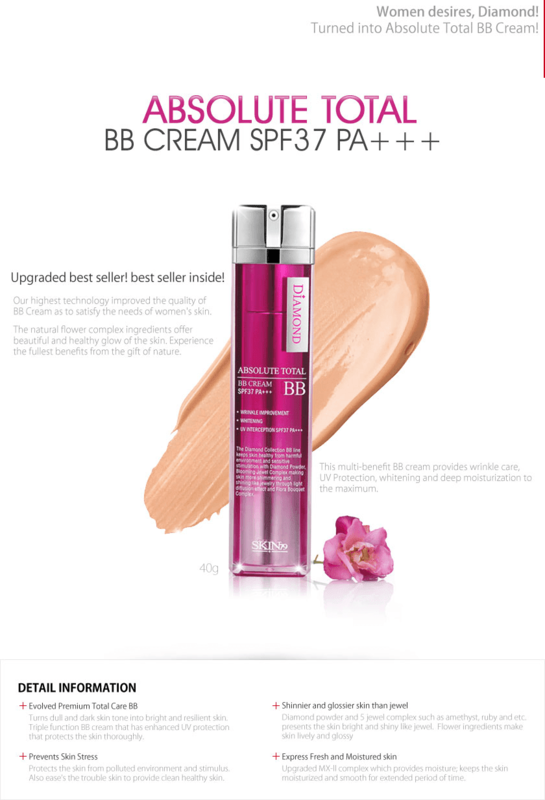 [Features] HIGH QUALITY MULTI-FUNCTION MOISTURIZING BB CREAM. 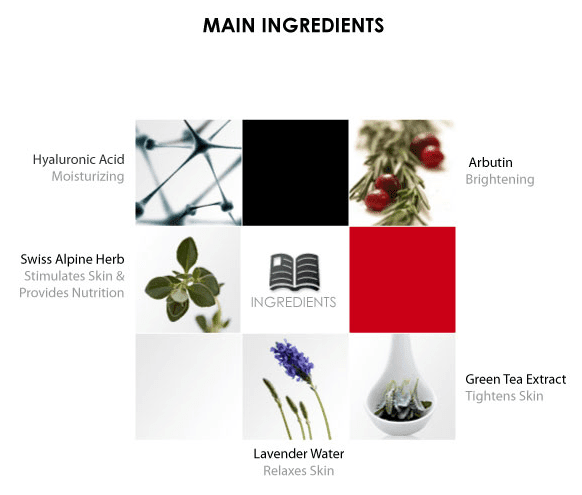 Luxurious tea ingredients helps skin remain moist and comfortable while presenting smooth and even skin. Also the cream lip & cheek completes the bright and lively makeup. 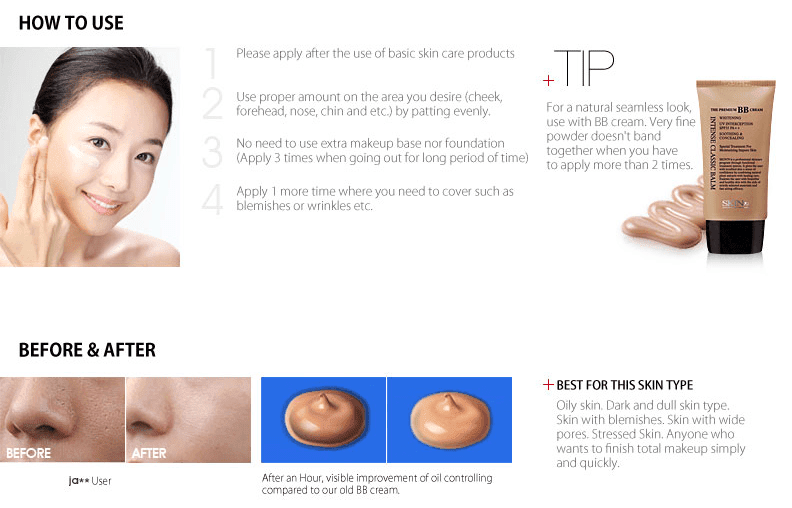 [How to use] BB Cream: Use it proper quantity on the area of your face like patting at the last step of skin care. 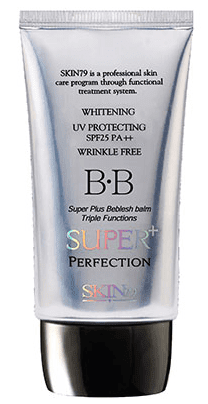 [Features] The triple functional BB cream keeps skin shining and lifting through whitening and wrinkle care effect, making uneven skin tone and skin texture clean with rich feel of hydration softly cohering to skin and protecting skin from UV rays. Rose pink color of Lip & Cheek tint completes brilliant and vital makeup on lip and cheeks. Suitable for : All skin types, greasy skin with lots of sebums, uneven skin and slimy skin tone, cover up redness and trouble areas of skin, very dry skin & wrinkle skin. 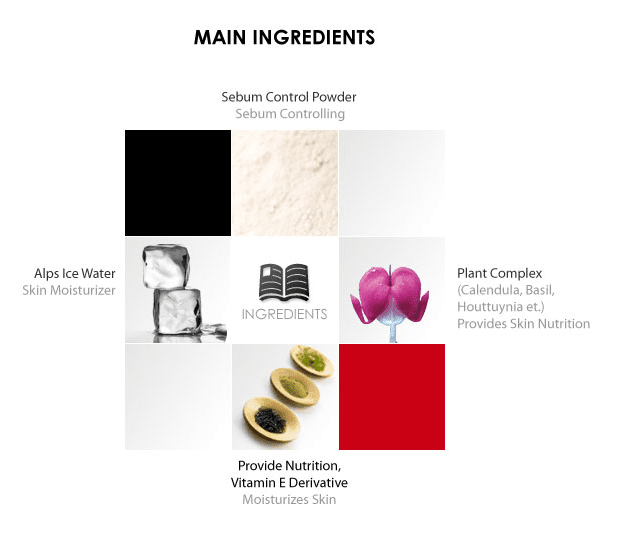 Plant based ingredients infuse the skin with moisture by controlling your oil and moisture balance. Fast absorbing, light weight formula leaves skin with a soft, matte finish. Multi-Vitamins maintains vital moisture without the feeling of being thick and heavy. 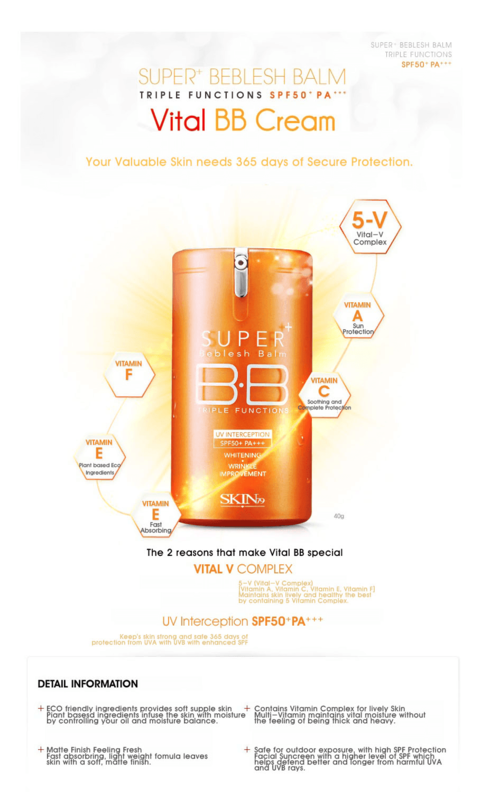 Facial Suncreen with a higher level of SPF which helps defend better and longer from harmful UV.A and UV.B rays. 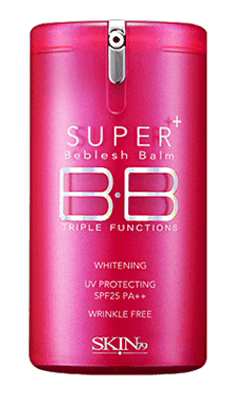 a triple function BB cream that makes skin bright and smooth, strengthens skin’s overall protection capacity and blocks melanin formation while giving elasticity to sagging skin. Phytosphingosina and Ceramide as similar ingredients to skin care can strengthen skin’s NMF and maintain balanced skin condition. OSMOPUR-N and Vital-V Complex soothe and protect skin from various harmful envirnments to make a moisturized, healthy skin. Use it proper quantiity on the area of your face like patting at the last step of skin care. 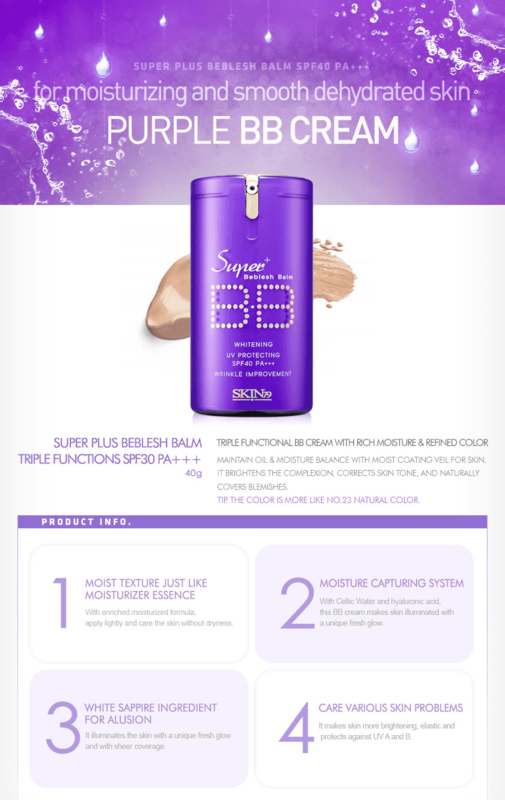 This is New version Gold Collection Super+ BB Cream 40g. 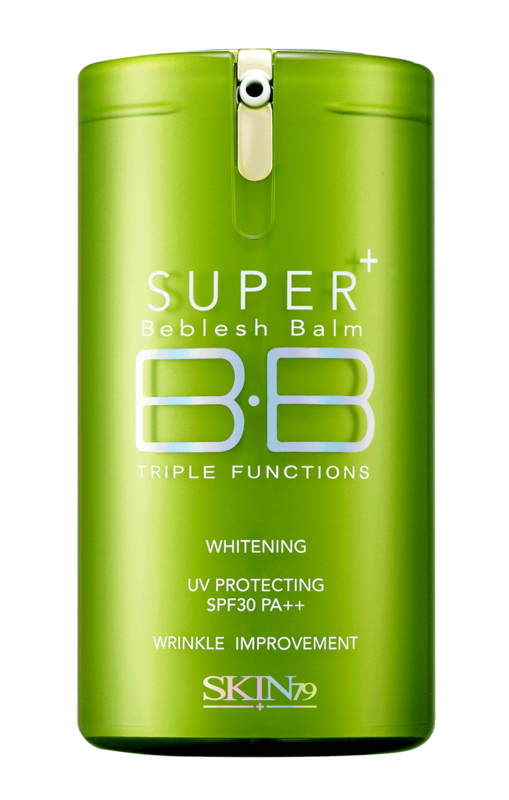 It is 3 effects functional beblesh balm. By Adenosine and Arbutin ingredients which are effective in whitening, wrinkles improvement cultivate more bright and elastic skin. Intercept ultraviolet rays UV A and B at the same time and protect your skin exposed from the sun more thoroughly. OSMOPUR ingredient of new concept which are mixed sunflower, rice bran, ivy extracts protect skin from various harmful conditions. Complex ingredient which good for skin moisturizing and soothing makes your skin always moist and healthy. This product has excellent cover function by composition of make-up base and foundation. It can correct your irregularly different skin tones naturally. At the same time by use of fine and soft texture porosity powder is excellent for your skin adhesion and sebum control. 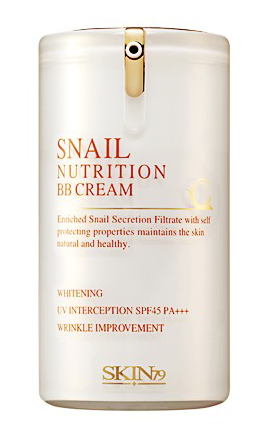 This is W/S shape which is good for skin affinity and it make your skin light, soft and dry all day long. 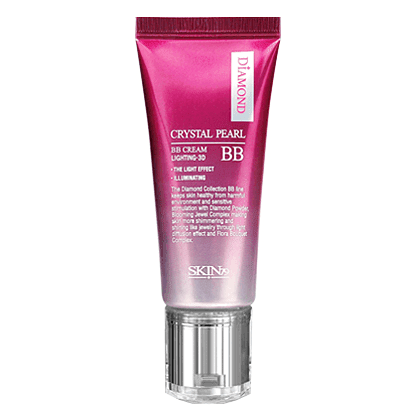 Skin79 Crystal Pearl BB Cream makes skin radiant and glossy with shining fine pearl. Makes skin bright and radiant by offering luster to skin, as well as, making skin three-dimensional in accordance with light angles. Diamond Powder and Blooming Jewel Complex consisting of 5 jewels including, Amethyst and Ruby makes skin more radiant and shining like jewelry. Flora Bouqet Complex extract makes skin vital and glossy by keeping skin healthy, by protecting it from harmful environment factors and sensitive stimulus. Pearl highlighter is built into this dual type container which makes facial contour more radiant and three dimensional. Holds on to skin strong without coming off and controls sebum and pores to provide long lasting oil-less clean skin. 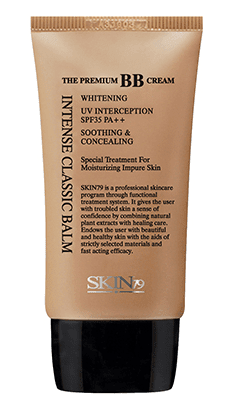 Covers skin trouble and blemish to event out skin tone. Gently treats damaged and sensitive skin. Make-up base + Make-up + Pact All in One. Speedy make up finish with multi-care functions. 1. Please apply after the use of basic skin care products. 2. Use proper amount on the area you desire (cheek, forehead, nose, chin and etc.) by patting evenly. 4. Apply 1 more time where you need to cover such as blemishs or wrinkles etc. 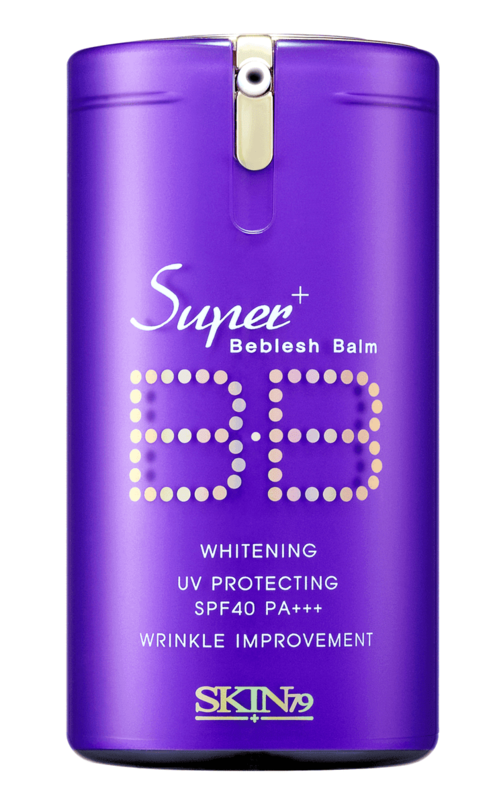 For a natural seamless look, use with BB cream. Very fine powder doesn’t band together when you have to apply more than 2 times. 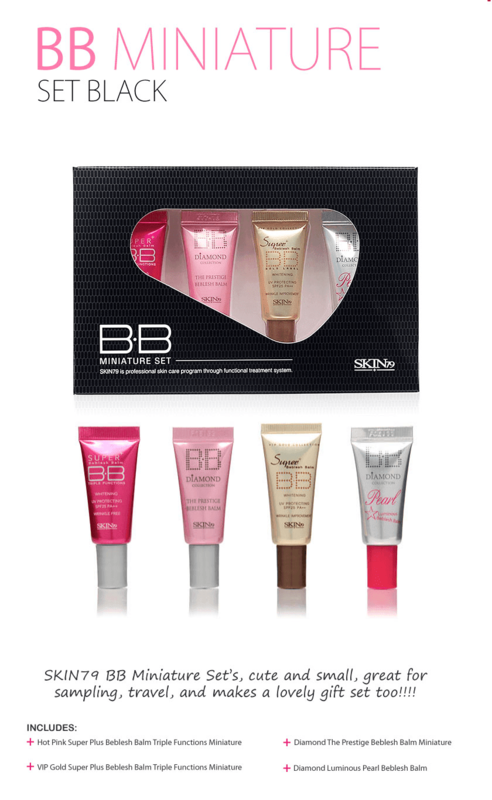 Skin79 BB Miniature Set’s, cute and small, great for sampling, travel, and makes a lovely gift set too. Cover BB cream perfectly and naturally conceals blemish parts and such impurities as liver spots and freckles with Perfect Cover Powder. Diamond Powder and Jewel Complex Powder of Ruby, Amethyst and Pearl make skin all the more radiant. 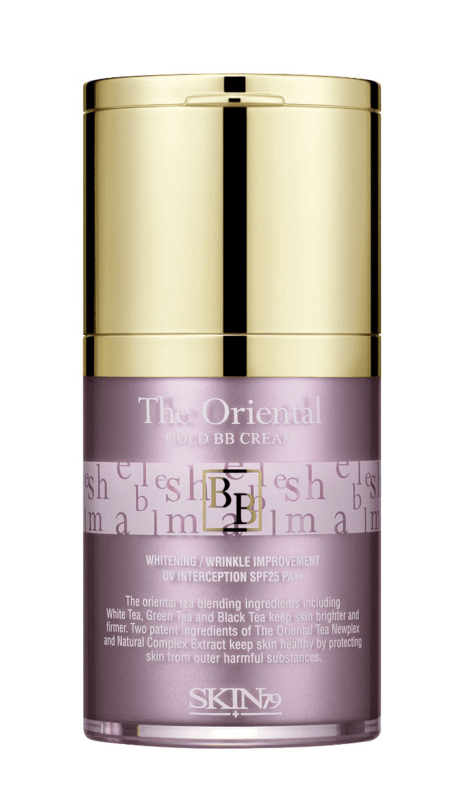 Direction: After applying BB Cream, put a small amount to where you want to cover and gently tap it with finger. Feel the water-enriched moisturizing texture at the tip of your hand! This super-moisturizing formula gives skin a soft, healthy, even-toned glow as it helps reverse the excessive oils. Formulated with 8 natural plant extracts, which softens fine lines and imperfections. Leaves skin soft and elegantly conditioned. Keeps the skin fresh just like right after the makeup all day with sebum controlling effect. 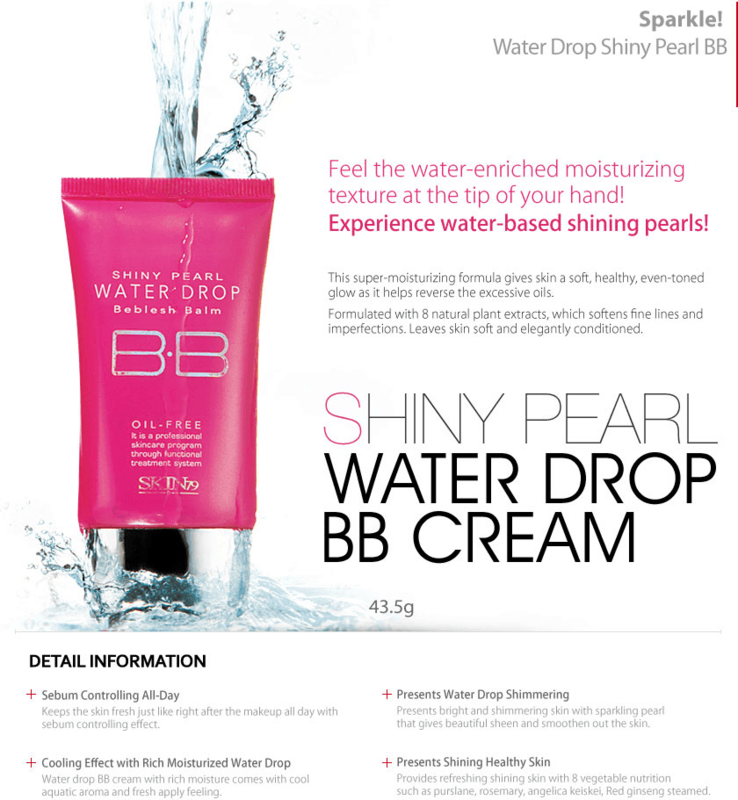 Water drop BB cream with rich moisture comes with cool aquatic aroma and fresh apply feeling. Presents bright and shimmering skin with sparkling pearl that gives beautiful sheen and smoothen out the skin. Provides refreshing shining skin with 8 vegetable nutrition such as purslane, rosemary, angelica keiskei, Red ginseng steamed. Pour small amount of BB cream onto your palm after using basic skincare products. Gently apply the cream in the following order: Cheek-Forehead-Nose-Chin. Pat lightly over the face to help absorbing. Apply small amount of cream onto cheeks nose. 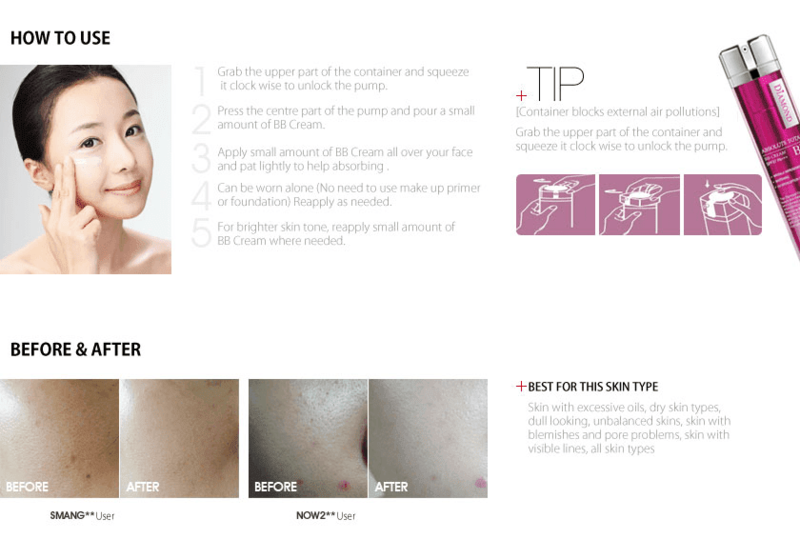 Special attention to T-zone areas for a more beautiful contour and highlight of the skin. 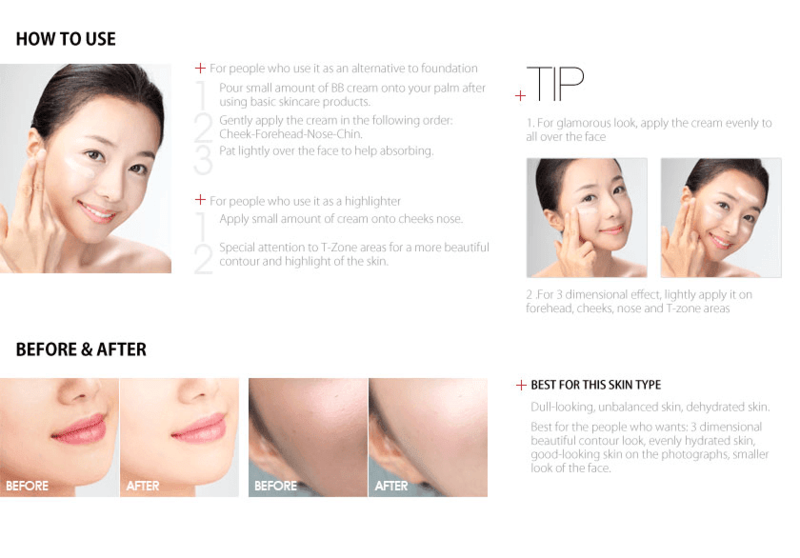 For glamorous look, apply the cream evenly to all over the face. For 3 dimensional effect, lightly apply it on forehead, cheeks, nose, and T-zone areas. Everyday UV Protection Anywhere Anytime OK! This powder sets and perfects color to create a smooth, flawless finish. This powder is oil-absorbing for the most comforable wear. This light-weight powder provides a broad spectrum of UV protection. + UV Rays STOP! 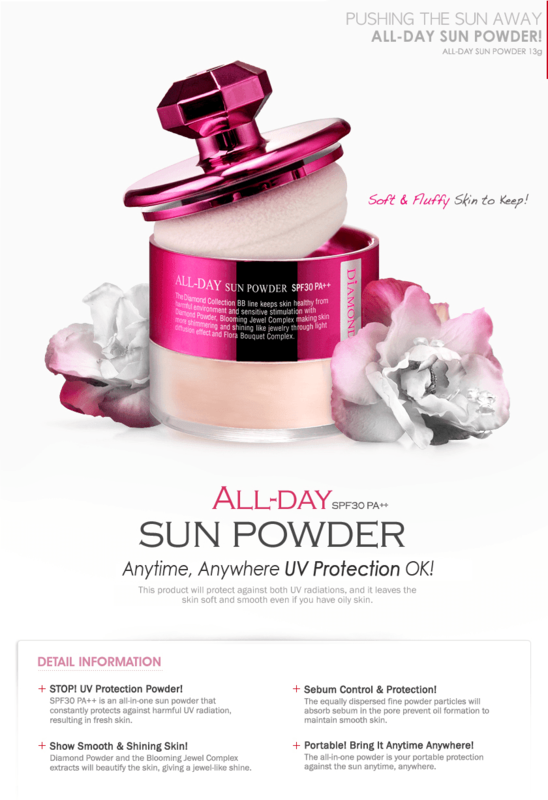 UV Protection Powder! 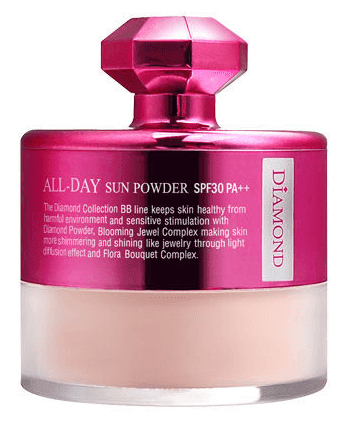 Effective UV protection (SPF30 PA++) Sun powder with no stickiness. + Presents hydrated and bright skin texture! 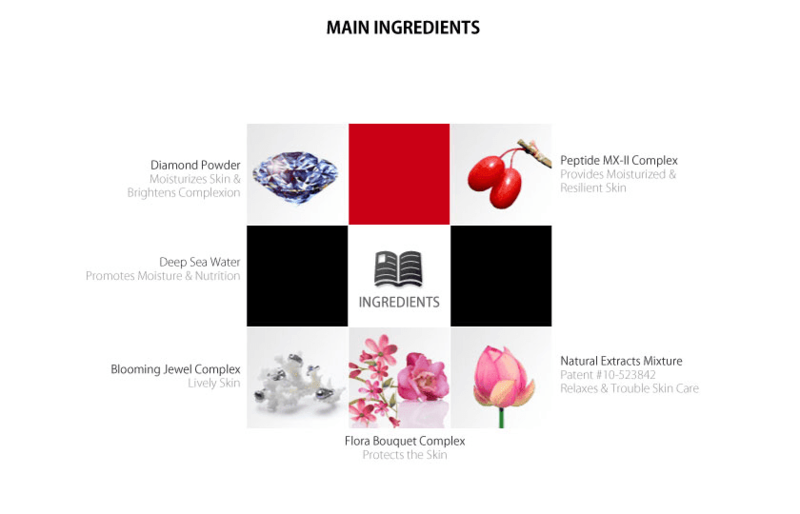 The mixture of blooming jewel complex elements and diamond powder ultimately makes the skin look shinnier and brighter. + Sebum controlling without clogging pores! Effective oil control which prevents excessive oils and skin decoration. Micro-particles absorb into the skin and presents natural look without clogging pores. Easy to use, it can also be used over make-up to maintain the fresh outlook anytime. Grab the knob and turn it clockwide to open. Remove transparent film inside container and turn container upside down mixing powder well, rubbing powder on sponge evenly. Pat lightly all over your face staring with prominent areas (such as cheeks, forehead). Light enough to carry them. Unlike sun creams, it can be reapplied as needed and it leaves soft and light after feeling. Easily absorbs, it can be worn frequently. Skin with excessive oils, dry skins, sensitive skinsn all skin types. Best for people who wants, natural looking make up. Provides long lasting clean oil-less skin by absorbing sebum with excellent porous powder. Protects sensitive troubled skin and also teenager’s skin with natural plant ingredients and special skin trouble care ingredient. Removes Keratin with Pappaya extract. Having excellent UV protection effects, there is no need to apply sunblock. 1. Apply thin layer of Dream Girls Beblesh Balm onto all over the face. 2. Use fingertips to spread gently until it has been completely absorbed. Turns dark and dull skin into clear skin by controlling the root. Non stop skin care has come true by wrinkle improvement function to maintain smooth and silky skin. Easy apply and rich moisturizing all day without darkening, just like a baby skin. Holds onto skin very thin to provide clear and natural tone. Keeps skin clear and oil-less by controlling sebum. 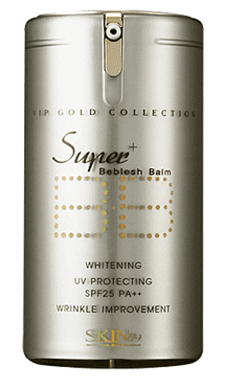 UV Protection SPF25 PA++ Protection for both UV A and UV B. 2. Use proper amount on the area you desire (cheek, forehead, nose, chin, and etc) by patting evenly. 4. Apply 1 more time where you need to cover such as blemishes or wrinkles etc. For dry skin, use enough amount of moisturizing products during basic skin care steps. For oily skin, reduce the oilyness by minimizing the skin care steps. 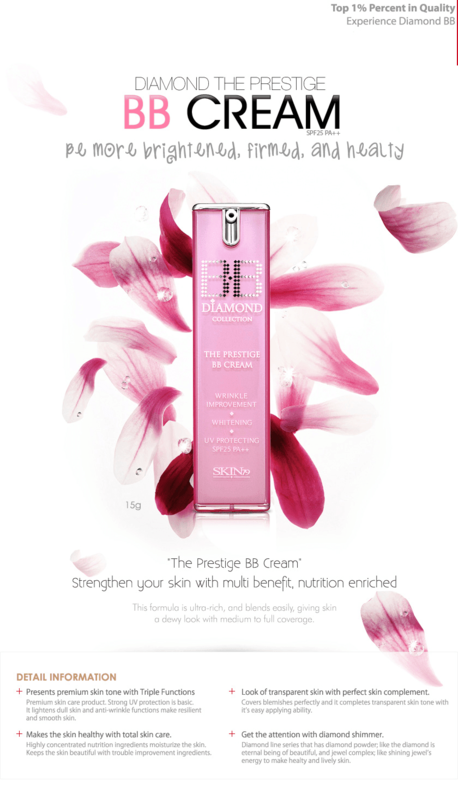 [Features] SKIN 79 Diamond The Prestige BB Cream: LUXURY BB CREAM THAT PRESENTS THE SPLENDID BEAUTY OF JEWEL. 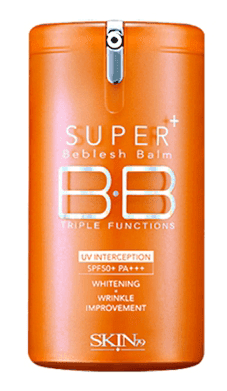 Triple function BB cream with premium skincare effects of jewel and peptideMX complexes which keeps skin looking smooth and bright. [How to use] Use it proper quantity on the area of your face like patting at the last step of skin care. The look of 3D face through the diamond light! A natural, natural looking shimmer highlights T-zone, eyes and cheeks to express the liveliness of the face. 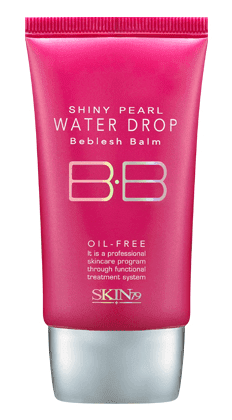 This Pearl BB helps replenish the moisture skin loses daily. 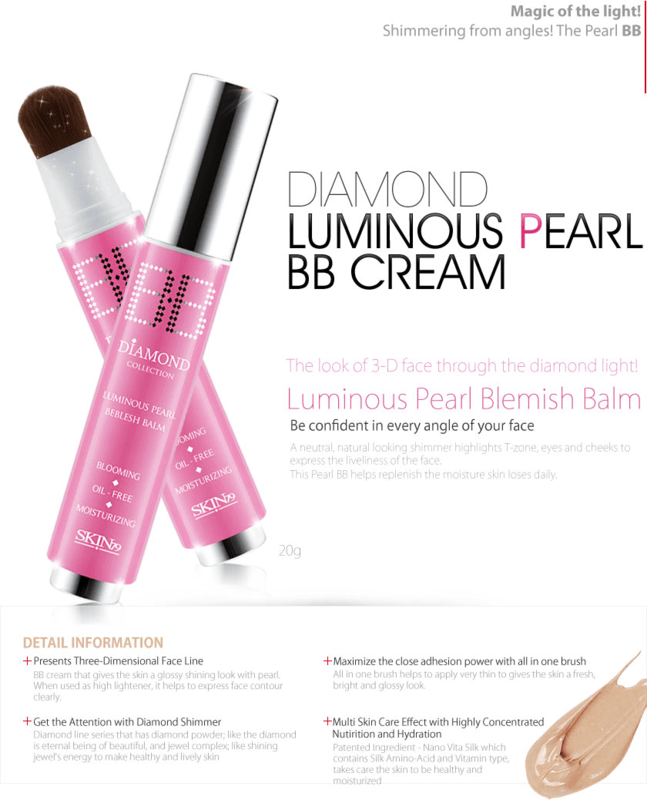 BB cream that gives the skin a glossy shining look with pearl. when used as high lightener, it helps to express face contour clearly. Diamond line series that has diamond powder; like the diamond is eternal being of beautiful, and jewel complex; like shining jewel’s energy to make healthy and lively skin. All in one brush helps to apply very thin to gives the skin a fresh, bright and glossy look. 1. After cleansing, apply the basic skin care products. 2. Press the pump and control the amount of cream. 3. 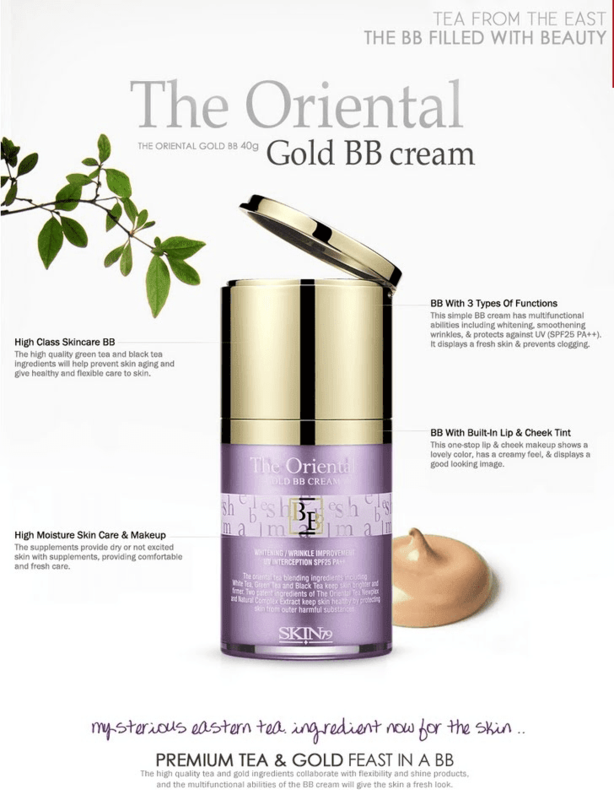 Gently apply the BB cream all over your face evenly to cheeks, nose, forehead and chin. Pat lightly to let it absorb well into the skin. 1. Press the pumps and apply small amount of cream onto your face under eyes, nose, chin, forehead. 2. Apply them lightly to nose and T-zone areas for luminous skin. Cleansing the brush: Twist the brush and let it seperate from the BB cream container. Using a neutral detergent, wash the brush gently and rinse out with clean water. Let it dry for a while until gets dry. Twist the brush back into the container. + Lively Skin Tone with 5 Marbles of Pastel Colors! Presents animation life into skin with pink. Complement the blemish with green. A fine gold. Brighten the skin tone with white. Makes the skin shimmer with violet. % Colors multi finish powder. + Scent & aroma on your face! Finish make-up with a fine feminine flowery aroma. + Jewel’s sparle adds dimensionality to face! Makes amazing shimmering skin tone when jewel complex powders are mixed together. 1. 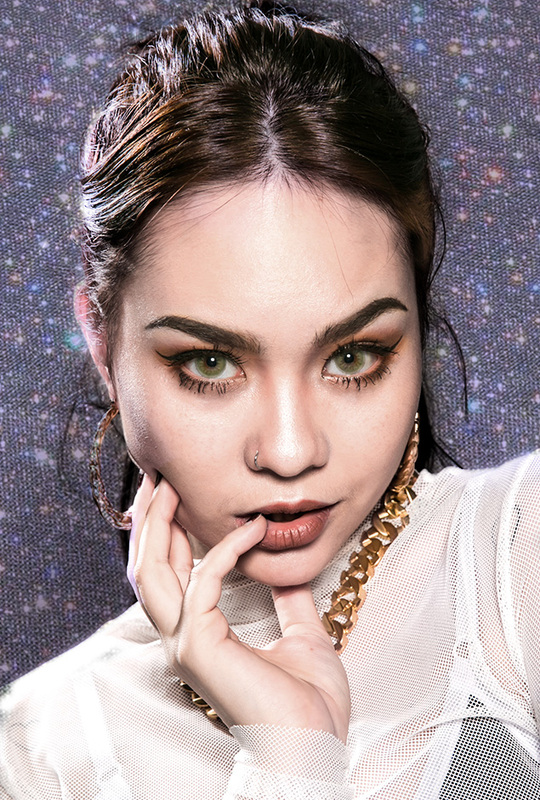 Use Star Glow Ball Powder as a finishing step of the make-up. 2. Use brush or Puff that was contained inside to evenly mix the colour of the balls. 3. Apply Star Glow Ball Powder to cheeks, chin, nose, and T-zone areas to highlight the most prominent areas of the face. The Star Glow Ball Powder is designed to luminate the face and it is sheer and lightly pearlized. Mix the balls gently using puff or brushes. The balls are fine to use even if it gets crushed. 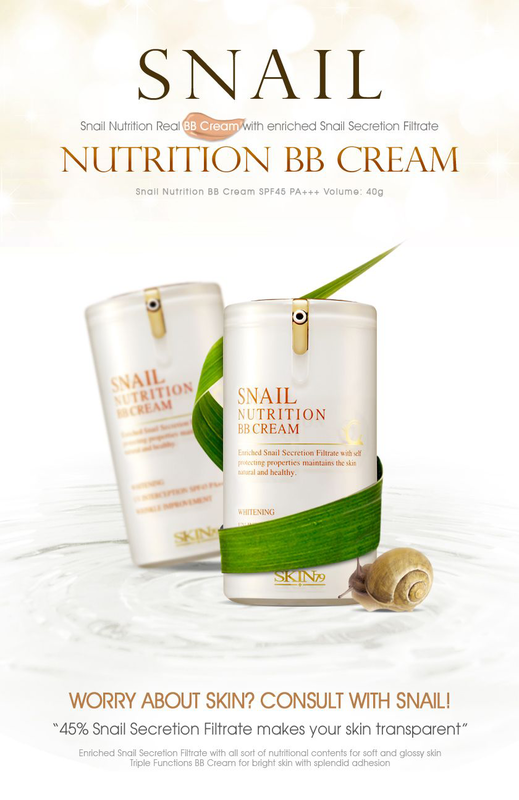 [Features] Skin79 Snail Nutrition BB Cream: Contain 45% of snail secretion filtrate, it prevent and heal skin demages and keeps skin moist and healthy.